Ridley Scott is not the directory of BLADE RUNNER 2049, but he has directed a lot more movies than BR2049 director Denis Villeneuve and he did direct the original Ridley Scott (every damn cut of it). So he was better list fodder. I confess I was surprised by how not moved I was by several films in Scott’s filmography considering he is a director I have warm feelings for. However, in generating the list, I realized why. The highs of his career are quite high and I have great respect and/or enjoyment of them so even though there are several mediocre to lower movies that he has made, most of the ten below I think are tremendously good. 10.) The Counselor- A filthy little movie that cast itself like a big movie, it is definitely not for everyone. But its groddy, pessimistic view of humanity stuck with me for days after. Also, look, it was this or WHITE SQUALL and this felt like a way edgier choice. 9.) Body of Lies- I confuse this movie with SPY GAME a lot because they are very similar—young agent doing his best under the care of an older, jaded, and possibly corrupt mentor. The script is no great shakes on this one, but Scott’s gift for shot composition and the relationship between the director and Russell Crowe leading to a quirky performance—Crowe plays the supervisor as both laid back and coiled in his casual misanthropy—saves the film. 8.) Black Hawk Down- Another feat of directing and performance that elevates an oddly thin script considering the rich primary material. This movie trades characterization for intensity, but oh how intense it is. 7.) Gladiator- We can debate the appropriateness of its Oscar win, certainly, but this adrenalized and yet, paradoxically, pastoral take on a swords and sandals epic is worth watching. Joaquin Phoenix’s sly performance as the spoiled man-boy emperor is a tasty treat. 6.) American Gangster- The movie suffers at times due to its split focus between Crowe’s FBI Agent and Denzel Washington’s Frank Lucas but both performances are great. The soundtrack is a treat as well, arguably Jay-Z’s best work until this year’s album. 5.) Thelma and Louise- Given Scott’s attraction to large scale stories, it can often be forgotten how he can elevate relatively small events and everyday people to epic levels, to make the common take a large enough significance to make the players seem larger than life. In some cases, it can be insufferable (see: A GOOD LIFE) but here it is perfect as the pain of two women becomes a modern feminist tale the remains a touchpoint even now, some 26 plus years later. 4.) Matchstick Men- Speaking of humor, I give you this movie where Sam Rockwell and Nic Cage conspire together as a pair of con men to ring out every laugh in the script. Not just a comedy though, MEN ends up being a weirdly affecting tale of a man so worried to connect to the world who ends being destroyed and reborn by doing just that. 3.) The Martian- One thing Scott does not often do well is humor, but here he manages it excellently, making a chamber piece compelling and endearing, the protagonist’s struggles becoming enriching, not just a grind. 2.) Blade Runner- Gorgeous. Ground-breaking. Forever referenced by films since. A little shallow, but, hey, when the movie is this sumptuous a visual delight, do you really care? 1.) 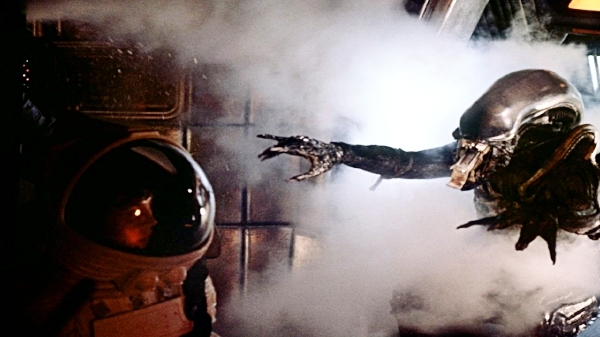 Alien- Ridley Scott’s masterpiece that he nailed on first edit (although the cut on the QUADROLOGY is a modicum better). A horror movie, a sci-fi movie, a study of human interactions movie. Not a single moment is wasted and it introduced one of the most enduring monsters in film history.